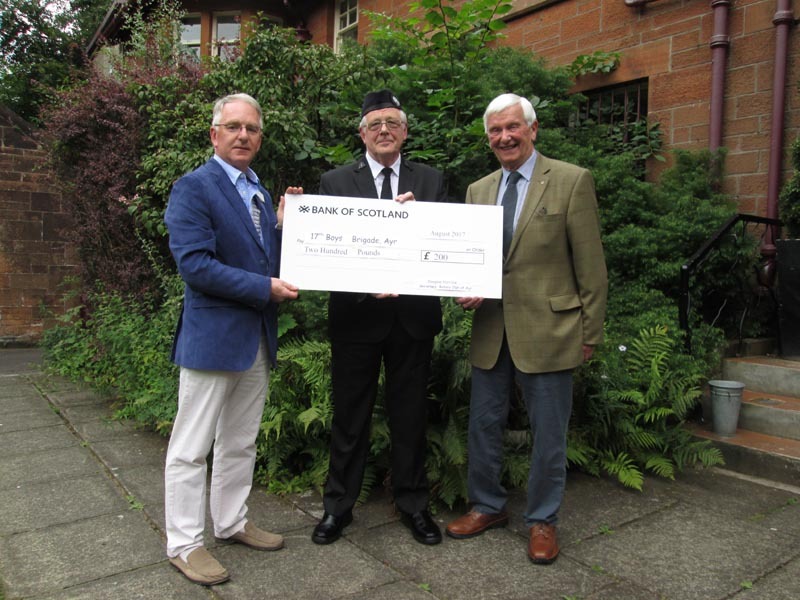 Douglas Wilson, officer (Lt.) in the 17th Ayr Boys’ Brigade company, attended our club meeting to be presented with a £200 cheque from the Treasure Chest fund. The presentation was made by President Craig and John Ewing, Community Service convenor. The money had assisted two company activities through the hire of a mini-bus. The vehicle was used for transport for the junior boys (under 12) during a week at the BB residential activity centre at Kirkham. Immediately following that it transported the older boys (12 and over) to the airport for a trip to Romania where they carried out work at an orphanage run by the Rhema Foundation. Douglas will be back at the club soon to tell us more about these activities and said that the Treasure Chest donation was greatly appreciated and had assisted significantly these adventures for the young boys.